More Sister Stuff: Honestly the BEST rolls EVER! So I found these on pinterest and they are seriously so so good! I am absolutely the worst at making bread, but these just looked so good I thought I'd try them. Since there's only two I tried to cut the recipe in half and did not turn out. But I've made them twice again in the last month...because they are that good, and if you follow the recipe exact they have turned out perfect each time. My only change, is for the flower I only use about 8 1/2 cups...just to make sure I don't use to much. Then, I just put them in bread bags and keep one out to eat, and freeze the rest until we eat them. And they taste just as good when we get them out of the freezer. :) You can find the recipe here. 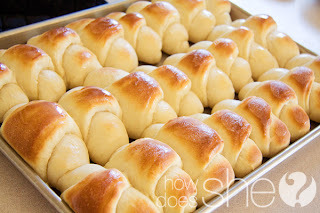 I finally tried to make these rolls tonight and they were awesome!! I have NEVER been able to make bread or rolls and was VERY skeptical that I would successful at making these ones, but like the recipe says, they are easy and they turn out great! My kids loved them too. Thanks for sharing.